Ani is the princess of a small nation named Inaco. She is hardworking, realistic and strong-minded. She was raised with the belief that royalty needs to work even harder than the people of her kingdom. That’s a good thing because she will need to work extremely hard to face the princes of two powerful kingdoms: Serenfaren and Mildonia. 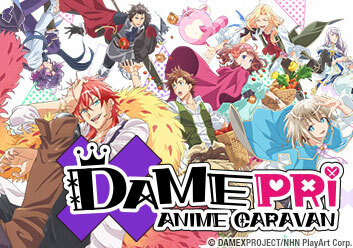 After all, when you have to deal with a narcissist, a womanizer, a fragile idol, and a shut-in otaku what can go wrong? After her father is injured, Princess Ani goes to Milidonia to sign a peace treaty. As she embarks on her journey home she encounters multiple princes seeking her attention. To ensure Inaco's safety, Princess Ani is sent to sneak into Milidonia to gather more information along with her country's guardian; a small flying pink raccoon cat. Princess Ani receives an invitation from Selenfalen to attend Prince Ruze's coronation ceremony. The pretentious princes pressure Ani to force Princess Mare to join. The princes pay courtesy visits to each other's nations to deepen the relationships between counties. They reunite with Princess Ani on their first visit to Inaco. Prince Ruze visits Milidonia. He is escorted through the crowded town in hopes that he can learn something useful to bring back to his people in Selenfalen. Prince Narek is preparing to provide moral support on the front lines with his father. How far will he have to go to find the perfect outfit for the occasion? Unsuspecting trouble is brought upon the townsfolk of Selenfalen after the princes get a little too comfortable in the hot spring. Mistakes are made when Ani and the princes miss the warning and show up to a new village with an unexpected curse. As the group comes to the end of their trip, the King and Queen of Inaco suggest Ani have her last dance. Will she choose a suitable prince to marry? The Princess of Inaco has been kidnapped while in Milidonia. The drama continues as the princes use their combined forces to scour the country for her safe return. After Milidonia appears to have broken the peace treaty, Prime Minister Chrom does everything in his power to put the people of Selenfalen at ease. Who could be the culprit? Princess Ani and Prince Narek will stop at nothing to protect the people of Inaco. But will that be enough to stop an invasion?